A completed table reveals the $1999 USD 18-core i9-7980XE running at just 2.6 GHz with slower Turbo Boost clock rates than the $599 i7-7820X. 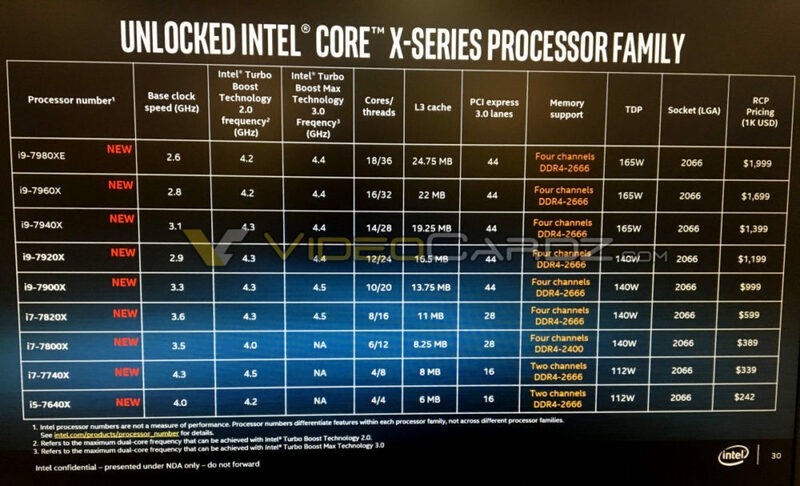 The unconfirmed presentation slide from VideoCardz shows that some of the higher-end Skylake and Kaby Lake Core-X SKUs will purportedly ship with significantly slower base clock rates than the less expensive models presumably to remain within the confines of the 165 W TDP. This practice isn't new, of course, but the leak is in line with an older Intel slide that first unveiled the i9-7980XE back in May. It remains to be seen at what extent these processors can maintain their respective Turbo Boost clock rates when under full load. 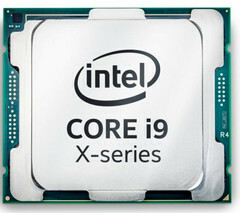 The Core i9-7900X, for example, will have faster Turbo Boost clock rates than the i9-7980XE at only half the price. AMD's 16-core Ryzen 1950X Threadripper is expected to run at 4 GHz with 64 PCIe 3.0 lanes compared to 44 lanes on the i9-7980XE and at significantly lower prices. Intel announced the 12-core i9-7920X with higher Turbo Boost clock rates in response, but the Ryzen 1950X will have the advantage of launching two full months ahead of Intel's October time window. The new lineup from both Intel and AMD will indubitably have system builders reanalyzing the price-to-performance ratio between these two options.